with phillip moved into the condo (how exciting! ), we needed somewhere for his tv to go. i already have a sizable flat screen in the living room, so it seemed the perfect place would be the guest bedroom. now, if you’ve ever visited the condo, you know there isn’t a lot of space. i mean, we have it perfectly decorated that not one more piece of furniture can really be purchased, which just means that if we can’t expand horizontally then we go vertical! yes, that’s right, we decided to mount the tv on the wall in the guest room so that it wouldn’t have to sit on a crowded entertainment unit. while the idea of a mounted tv sounds thrilling, the actual process of getting that thing hung became another item on the bucket list that i never knew was there. and because i didn’t want all my fans to miss out on the fun, i invited kyle and kari over to assist/watch/laugh. you know, help us create proof that the tv once was not hung and now is affixed perfectly to the wall. so, in order to mount a tv, you obviously need the proper tools, right? right! first things first, the wall mount. a positive attitude accompanied by lots of enthusiasm. and last but not least, very full glasses of wine. cheers to home improvement! another early morning arrived for brian and me. he wanted to get a good start so that he could leave work at a more reasonable hour for some friday fun, so we whisked out into the already windy day and took the truck over to 24th and folsom for brian’s favorite cup of coffee at philz. he said this spot was his daily hangout once upon a time, so if it’s good enough for him, it’ll work for me, too! 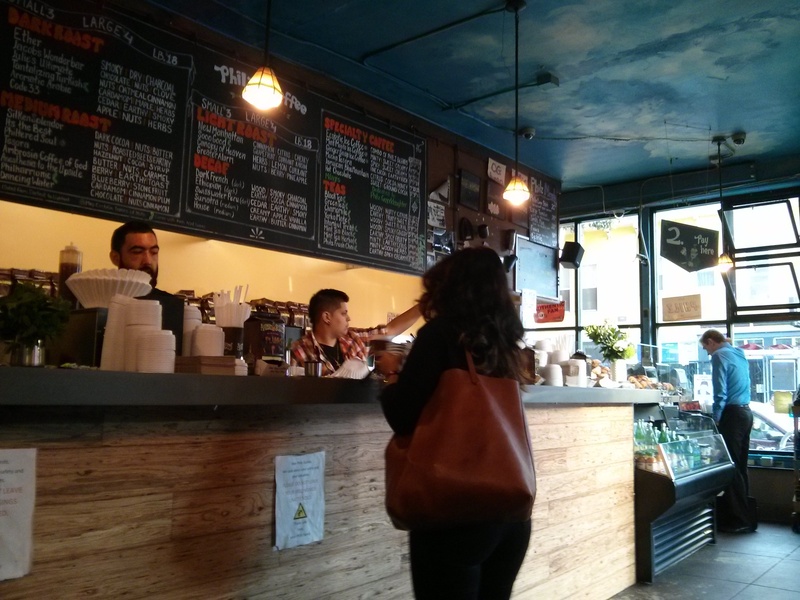 when we walked into philz, i was instantly reminded of the east side jittery joe’s back in athens. it’s artsy and eclectic, and i loved every ounce of it. it’s quite the menu they’ve got here, so i trusted brian to do the ordering for us both. he got us each a small philtered soul, a lighter medium blend of hazelnut and chocolate. um, yes, that sounds amazing! 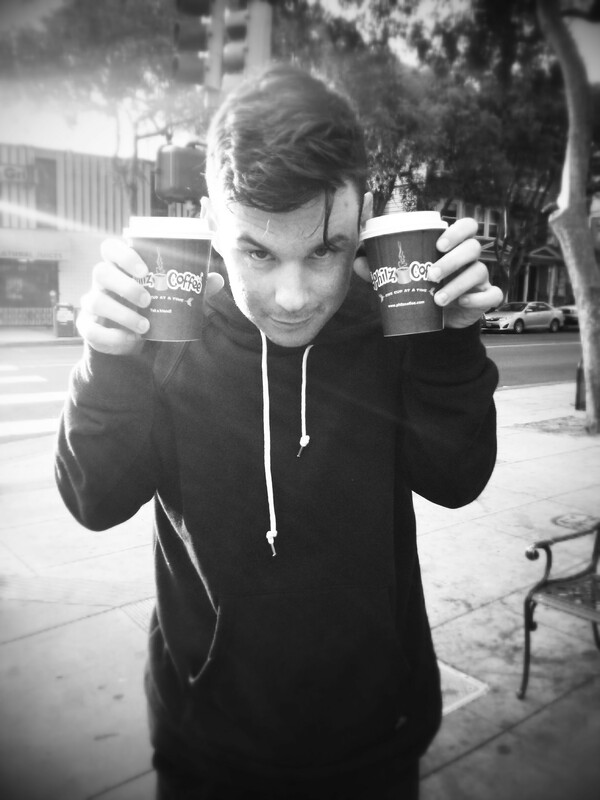 we took our cups to-go and had our first sips out on the sidewalk. although a little on the sweeter side, the coffee was flavorful, a lovely treat to wake us up at just a quarter past the seven o’clock hour. gah, he’s just the coolest! we then headed east on 24th to find dynamo donut shop. my friend mike had heard good things about it, so i felt it was my personal duty to see if the fun was warranted. this little place is actually a walk-up counter serving up homemade donuts and coffee. i was in the mood for something chocoately, so i gladly let the cashier recommend the chocolate rose. 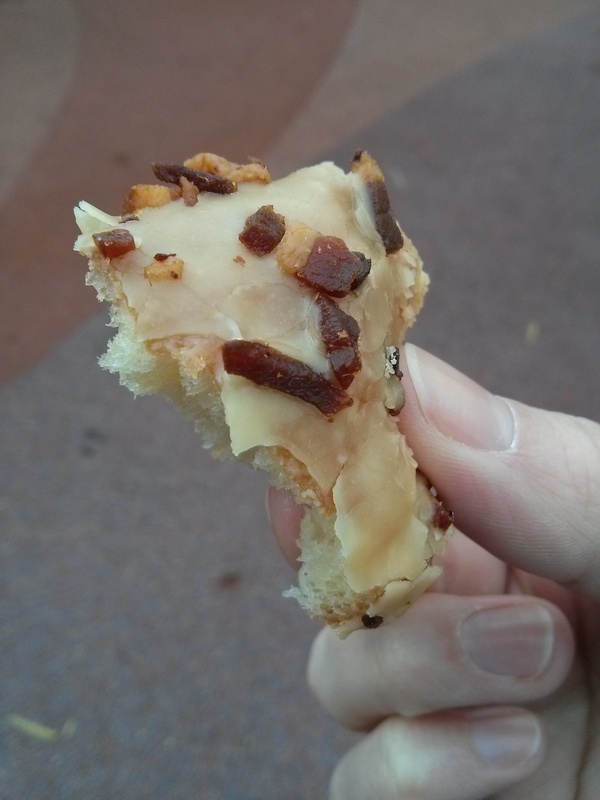 brian went for a saltier selection with the maple glazed bacon apple. she popped them into a to-go bag for us so that brian and i could enjoy them in a nearby park. we plopped ourselves on top of the artful sea serpent because that seemed the most obvious thing to do. we decided that sharing the donuts was the perfect thing to do. brian bit into the chocolate rose first, and his face said it all: he really didn’t care for it. whoops! i took a taste to see if i agreed but found i felt differently. 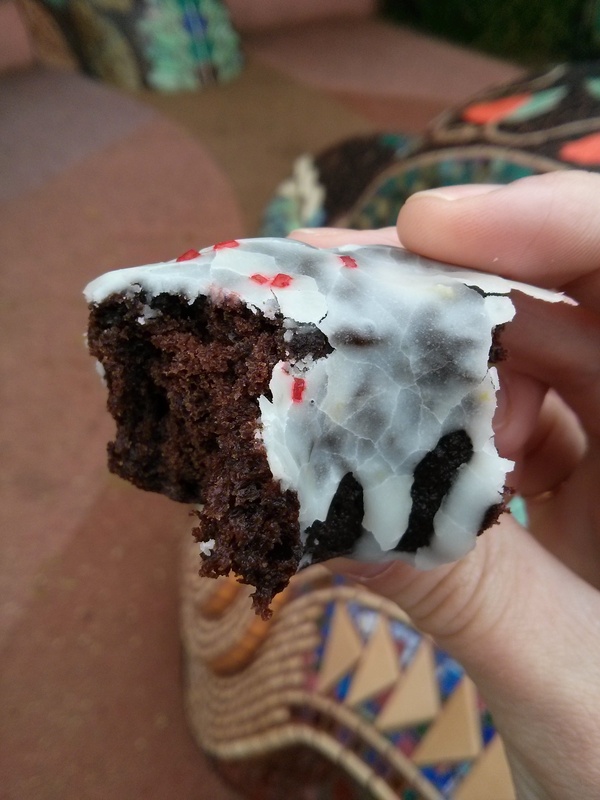 i actually quite liked its bittersweet flavor and cakey texture. brian did come around to admit after a few more tries that it wasn’t so bad after all. even though i was a fan of the chocolate rose, i might say the maple glazed bacon apple that brian picked out was pretty awesome. the glaze was just the right thickness to coat the donut but not take away from the subtle and sweet syrupy-apple flavor. oh, and let’s be honest, no breakfast is complete without bacon, right? ah, yes, how american of me! it was about that hour for brian to head out to work, so he dropped me off back at cafe st. jorge. i just couldn’t stay away! 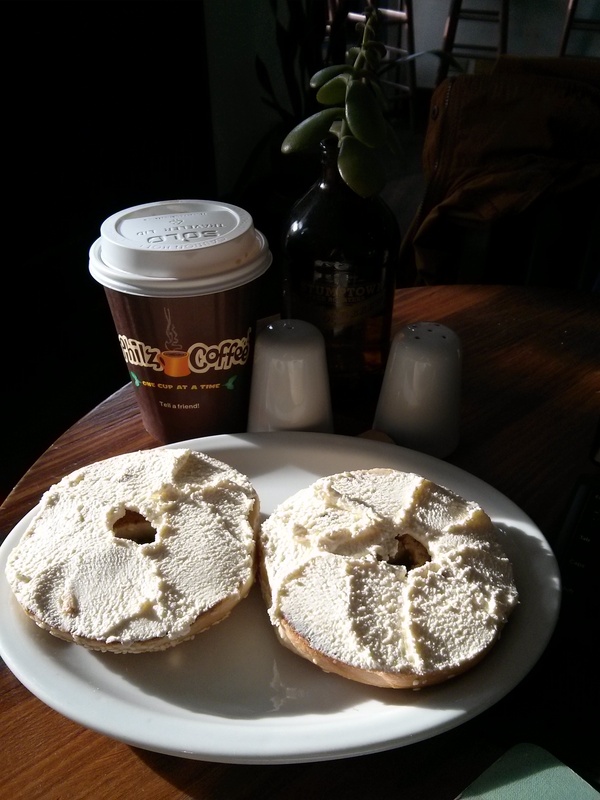 i snuggled into the booth with a sesame bagel and organic cream cheese and wrote the morning away. all of philz coffee went straight to my head and got me uber focused. i knocked out a whole day and a half of san fran fun in a short couple of hours. booyah!